This week the Compliance Jobs Report has CCO personnel moves at Vanguard, Deutsche Bank, Realogy Holdings, and the lovely city of Beverly Hills. 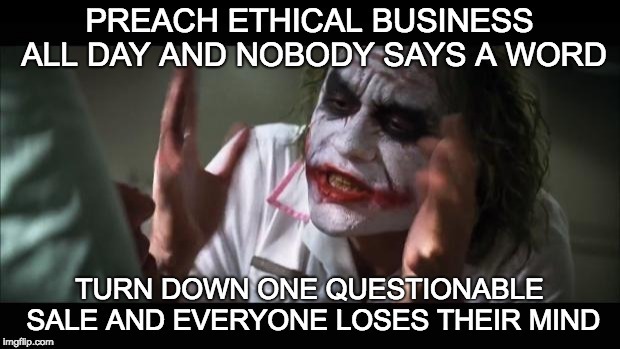 Several compliance professionals have hit career milestones, we have a few cool job openings, and our Meme of the Week goes out to all you business ethics specialists. Mutual fund giant Vanguard Group has named principal Joseph Brennan to the newly created role of global chief risk officer. Brennan joined the firm in 1991 and most recently had been head of the equity index group. He will oversee enterprise risk management, including enterprise security and investment risk management. It’s about time, too: Vanguard has $5.1 trillion under management. Deutsche Bank has promoted Stephan Wilken to global head of anti-financial crime and chief of anti-money laundering. Wilken, who is based in London, has been with the bank for 20 years. He will report to Sylvie Matherat, DB’s chief regulatory officer; and replaces Philippe Vollot, who left DB to head up compliance at Danske Bank while a money-laundering scandal there is mushrooming. Nice move: Liz Gehringer, previously chief ethics & compliance officer for real estate company Realogy Holdings Corp., has been named chief operating officer of Realogy’s Coldwell Banker division. She is based in New Jersey. The city of Beverly Hills, Calif., has hired Eduardo Luna to be its first independent city auditor. Luna had been city auditor in San Diego for 10 years. In his Beverly Hills role he will report directly to the city council. Marlene Timberlake D’Adamo is returning to her job as chief compliance officer for retirement fund CalPERS, after serving as its interim CFO. The retirement fund has hired Michael Cohen for the CFO post. Cohen held a similar position with the state of California. Jason Davis has been promoted to chief compliance officer at Enhanced Resource Centers in Jacksonville, Fla.. Davis has worked for the business process outsourcing firm for 14 years. Shelley Workman-Raspa has been named ethics & compliance lead for McCormick & Co., a food service business based in Hunt Valley, Md. Workman-Raspa has worked for the McCormick in a variety of compliance and business process improvement roles since 2006. JP Morgan Chase has promoted Suve Banerjee to EMEA head of anti-corruption compliance in London. Banerjee has been with the bank since 2016. Kurt Stitcher has a new job as vice president of global compliance for medical device company DJO Global, based in San Diego. Stitcher had been working for manufacturer Axiom in Chicago as interim chief compliance officer since last year, and was at Smith & Nephew before that. .
James Downing has joined Flywire, a Boston-area fintech company, as compliance specialist. Downing previously worked as a risk consultant for PwC in South Carolina. Flywire wins the prize this week for coolest company name. And the Securities and Exchange Commission has named two new associate directors in the Enforcement Division. Anita Bandy, previously an assistant director in the enforcement division, replaces Gerald Hodgkins, who left the agency for private practice. Carolyn Welshhans, previously an assistant director in the division’s market abuse unit, replaces Scott Friestad, who passed away earlier this year. Becki Sweeney is celebrating one year as business risk and controls advisor for USAA in San Antonio. Aaron Marshall is celebrating one year as a manager of compliance programs with pharmaceutical company Lundbeck in Chicago..
Melissa Akali is celebrating her first anniversary as associate vice president for compliance for Aveanna Healthcare in Atlanta. Helen Djupsjö Davies is celebrating five years with inspection and product testing firm Intertek in Geneva, Switzerland, where she is a regional risk and compliance officer. Ryan Barker is celebrating 10 years as chief privacy officer for Capital One in Plano, Texas. Debra Sabatini Hennelly has left consultancy XCEO to co-found a risk management consulting business called Resiliti in New York. Thailand-based Bank of Ayudhya has selected Nice Actimize to strengthen its anti-money laundering compliance systems. Armando Cruz has left Control Risks to become a director with KPMG in Mexico City. Pfizer is looking for a senior corporate counsel to work in its anti-corruption program. Job is based in New York. No word on scoring any free pills. Nordam, an aerospace company based in Tulsa, Olka., is recruiting a senior manager for compliance & integrity. Comcast is looking for a SOX auditor. Job is based in Philadelphia. That’s all for the week ending Sept. 14. Enjoy the weekend, and if you have a tip or want to brag about your new job, promotion, career milestone, or anything else, email me at [email protected] or find me on LinkedIn. I’m always happy to give credit to the many hard-working people here in our corner of the business universe.